4.1 out of 5 based on 31 bloggers and 7 commenters. 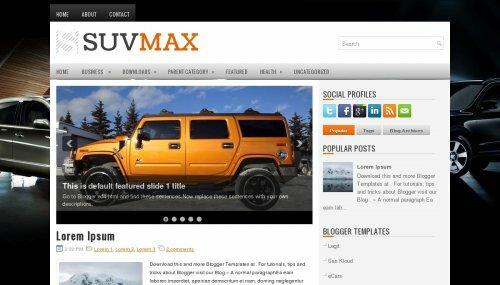 SuvMax is a free blogger template adapted from WordPress with 2 columns, right sidebar, footer columns, slider, social bookmarking icons, posts thumbnails, tabs, drop down menu and well designed threaded comments. MY blog Description is doesn’t working what should i do ? How do I get the featured post slider to move, and the navigation bar of the categories removed?! No sé cómo solucionar el problema. I don’t know how to solve the problem.